The US fiscal negotiations are putting pressure on the muni bond markets. ETF Trends: - The tax hoopla has depressed municipal bonds, with high-grade 10- and 30-year munis comparably yielding as much as taxable Treasury securities at 1.79% and 2.73%, respectively, writes Randall W. Forsyth for Barron’s. According to reports from trading desks, bids have become more scarce as a greater number of investors are sitting on the sidelines and waiting it out as the fiscal cliff goes down to the wire. Congress has reportedly proposed levies on high-income investors in munis as part of of the deficit plan. More pessimistic muni observers are wondering if taxes could be imposed retroactively on tax exempt securities. George Friedlander of Citi, though, believes this is a “pernicious concept” that could destroy confidence in the federal government’s ability in the capital markets. 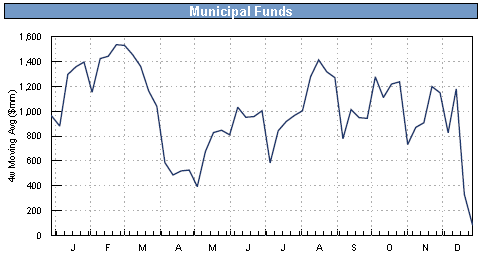 Fund flows into munis have slowed to a trickle. Once again some zealous politicians who wish to "tax rich people" are simply going to transfer funds from municipalities to the federal government (in an inefficient manner). ETF Trends: - Friedlander has also pointed out that if there were a limit to the value of tax-exemption on munis to up to a 28% cap, yields would rise 0.4% to 0.6%, which would devalue munis by $200 billion. Looking at the recent correction in muni ETFs, the potential tax hikes may have already been priced in. 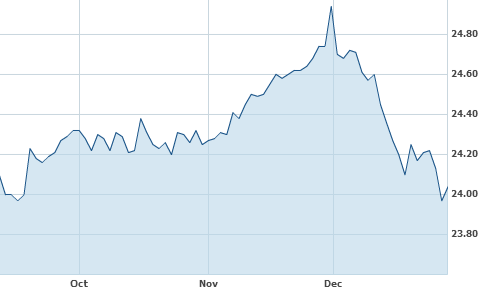 Indeed the market has corrected from the peak reached at the end of November, as the chart for NY munis shows. Ultimately whatever politicians decide to do, they need to get it done soon in order to return some certainty into this market. Otherwise they simply end up hurting municipalities around the nation who rely on this market for funding.